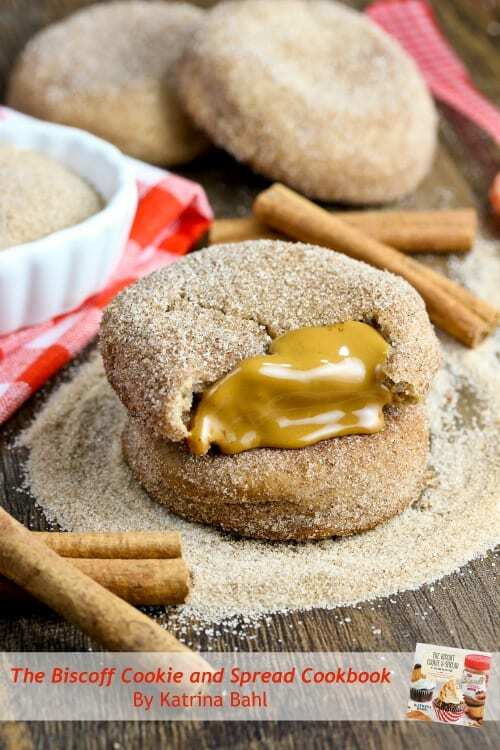 These thick Biscoff Stuffed Snickerdoodles oozing with creamy Biscoff Spread are a crowd-pleasing cookie recipe just in time for the holidays! I’m excited to be able to share these cookies with you from my cookbook along with a fun giveaway from my friends at OXO! First I just want to say thank you to all of you who made last week such a fun week for my cookbook to launch. Only 2 hours into the publication date and you all had me in tears with your kind words, support, and enthusiasm about my book. This project was a lot of hard work and I’m so over-the-moon-excited to finally be able to share the details with you! See that look on my face? It is pure terror. I got a call on Monday night from a producer on the TODAY Show who contacted me for a completely different recipe and story on my site not related to Biscoff. 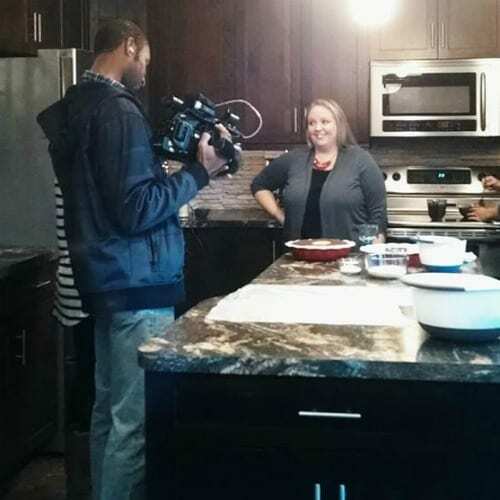 By Thursday they flew out to Ohio and we were filming a fun piece that will air closer to the holidays! I’ll keep you updated! Here’s a little peek of me with the TODAY Show cameras rolling. In the meantime you’ll just have to keep stopping by for more chances to win The Biscoff Cookie and Spread Cookbook (this time with a wonderful holiday baking package)! My friends at OXO thought it would be fun to give you everything you would need (and more!!) to make these sinfully delicious Biscoff Stuffed Snickerdoodles from page 47 of the cookbook. Whisk together flour, baking soda, cinnamon, salt, and cream of tartar. Set aside. In a large bowl using a hand-held mixer or stand mixer fitted with a paddle attachment, cream butter and sugar for 2 minutes until light and fluffy. Slowly add the dry ingredients to the wet and mix until just combined. Using a cookie scoop place 6 rounded Tablespoons on an ungreased cookie sheet lined with parchment paper or a silicone baking mat. Gently press dough down into discs (about ¼” thick). Top with approximately 1 teaspoon Biscoff Spread then another disc of cookie dough. Pinch the seam with your fingers to seal in the Biscoff Spread. Roll in cinnamon sugar. Bake for 10-12 minutes. Allow the cookies to cool on the baking sheet for 4 minutes and transfer to a wire rack to cool completely. Sprinkle each cookie with more cinnamon sugar if desired. Please use the giveaway entry form and leave a comment on this post to be entered (You MUST leave a comment on this post; entries will be verified). By entering this giveaway you are agreeing to the Official Rules. This giveaway is a sweepstakes. Open to continental USA residents over age 18. Winner(s) will be chosen by random, announced here, and will be contacted by email. Winner(s) must respond within 48 hours to claim the prize or a new winner will be chosen. Oooh,.. those cookies look awesomely tasty! Yummy… thanks so much for the recipe and wonderful giveaway. I love biscoffs. Can’t wait to try these. EEEEEEEEEEEE! I’m still so excited for you!!! Your cookbook looks phenom. and it’s so wonderful that you got to do a TV segment-I bet you did great! These cookies would be a huge hit at our next family get together! Love the gooey biscoff center! Holy cow those look amazing! Love it! Love Biscoff! I can’t wait to make the cookies!! I just got my #BiscoffBook today, but I would love to win a signed copy, plus some fabulous OXO products! I must try these cookies. The creamy Biscoff in the middle looks so yummy. Congrats on all the wonderful happenings! Cookies look awesome. These look Amazing! Thanks for the give a way! I love your recipes!! How yummy! Thank you so much for the giveaway! I just entered. I love Biscoff cookies and spread. Snickerdoodles filled with biscoff sounds so yummy. These cookies look amazing! Can’t wait to try this recipe! I love Biscoff cookies and the spread. I’m definitely going to make this recipe! It looks really good. I love the measuring beakers! These look fantastic! Gooey centred cookies are absolutely a winner for me and my family. Oh, wow!! These look so amazing!! I am so excited for you! The book looks gorgeous! And these cookies – wow! Filled with Biscoff! Pinned! Oh my goodness……………two of my favorite things together…Snickerdoodles and Biscoff Spread!! So much to be thankful for this season. Honestly, those cookies look SO delicious, I can only imagine how great they must’ve tasted! Definitely gotta try them some day. Congratulations on all your success! Love these cookies! What an amazing idea for a cookbook!! I have never eaten Biscoff cookies but I would love to try them after seeing the picture above. Those Biscoff Stuffed Snickerdoodles will be a real hit at Thanksgiving. Can’t wait to try these, I’m in love with the gooey Biscoff filling!!! What a fantastic giveaway. I need everything that is being offered! Wow! What a perfect collection heading into holiday baking! Congratulations on the book! The giveaway is amazing! This cookie book looks so amazing. I am all about the Biscoff! I love snickerdoodles and I love Biscoff, so I’m thinking thaI I’m going to love these cookies! Super congrats for your cookbook and great blog. Would love to win this giveaway for my daughter! Yum! I need to make these STAT! Thanks for the chance to win! Awesome stuff – thank you! Thank you for the opportunity to win! I work at a huge kitchen store and I love OXO products! I can’t wait to make these they look great. Those look tasty! Thanks for the giveaway opportunity. Looks yummy! Congratulations on the book. I’m so excited to make these cookies. Thanks for the recipe & the giveaway. I would be so excited to win the cookbook! Biscoff is so yummy! OXO products are the BEST! I would be thrilled to win the holiday baking set. Thank you for the giveaway! These look so yummy! Can’t wait to try them out!! Way to go! I can totally see the terror, but I think excitement shows through even more. I love Snickerdoodles and this looks like a great adaptation. Will try soon. I make Snickerdoodles from an old recipe. These look like an interesting variation. Will try soon. These look awesome! Definitely will be trying these this weekend! Never made snicker doodles, but I may have to try this holiday! My daughter and I are going to make these together.we can’t wait to see what the kids say.thanks for sharing. These would be the perfect starter set for my daughter as she sets out on her own. Anything cinnamon being her favorite she’s going to love this recipe. Those cookies look like something you should enjoy in private. I would not share with just anyone or everyone. Congratulations on your cookbooks! It’s on my wishlist!! And thanks for the giveaway! I have some Biscoff in my pantry begging to go in these cookies! 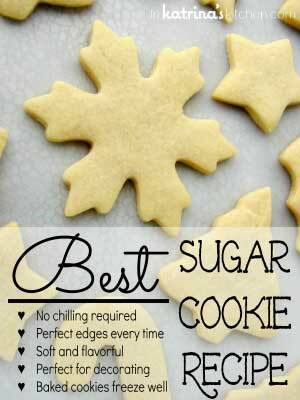 This would be great for my holiday baking. Thanks! Oh my, I have never seen a cookie look so delicious. I am going to have to try to duplicate these. Thanks for the wonderful recipe! I have never heard of Biscoff. I will have to look next time I go to grocery store. Sounds amazing! 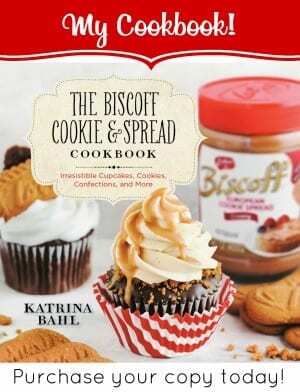 I love baking with (and straight-up spoon-eating) Biscoff spread and this book looks fantastic!! These look like the perfect cookies to make for my cookie starved daughter who is on a semester abroad and says they don’t know what cookies are in Spain. These cookies would be an awesome addition to the Thanksgiving cookie platter. I love Biscoff! Thanks so much for coming up with so many great recipes!! Looks Yummy!!! 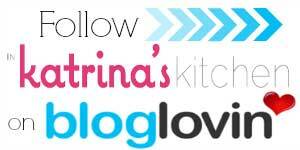 Just discovered your blog…..looks very informative and fun!!! Will pass on the info. to friends and family…Good Job!! Love snickerdoodes–check. Love Biscoff spread–check. Putting these cookies on my must-make-soon list–check! I can’t wait to make these cookies for my family! They look super yummy! Finally, a cookie recipe that makes use of my huge Costco size Biscoff spread! Any recipe with Biscoff makes it great! The problem is keeping it on hand for recipes without eating it! What a great giveaway! Thank you for the opportunity! Congrats on the book!! You are a rock star!!! That is so cool that they wanted to come film you for a show! I can’t wait to watch! I think I would be so nervous and stumble over every word! And these cookies…good gravy I love that oozing Biscoff!!! I like the color and designs of their kitchen gadgets. It’s fresh and young. I love Biscoff and these look yummy!!!! These pictures are making me hungry,my mouth can almost taste them. I love Biscoff, and this recipe looks great! I’m going to add it to my holiday cookie project this year. 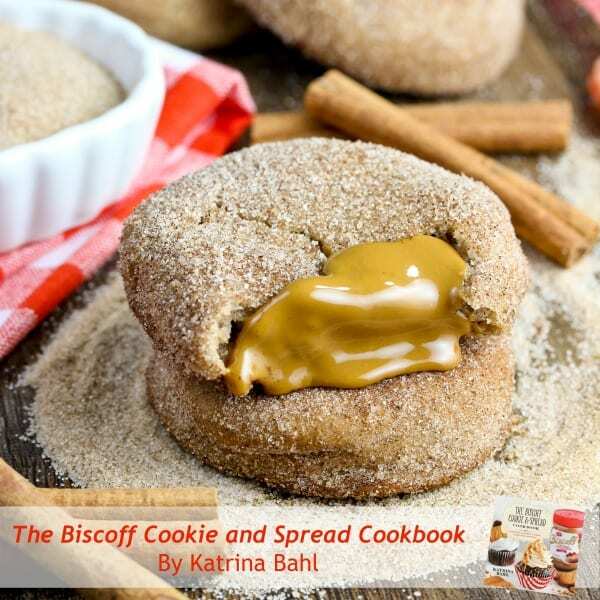 I’ve never tried Biscoff spread – but would love to, especially with this recipe! I have never tried Biscoff. I will have to put that on my to do list. Such an awesome back and a great giveaway! Thanks so much! This cookie looks AMAZING! Hoping I win, cause I want to see all the other goodies in there! 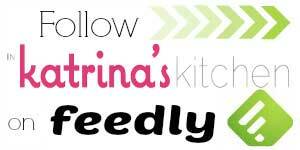 Greetings, Fabulous giveaway, love the recipe. I would be sure to use this giveaway…Thank you!!!! My family and I are absolutely crazy for Biscoff! I’ve been dreaming about this cookbook since you announced it a while back! Ahhhhh!! Looks so incredibly fantastic!! OMG! Those look amazing. I am definitely pinning this recipe. I fell in love with Biscoff years ago and have subsequently gotten some of my friends addicted to it. 🙂 I love spreading it between to peanut butter cookies. Love these cookies. Would love to win. I cannot wait to try those snickerdoodles!! Goodness. Those cookies. I’m drooling. Congrats to you I all your successes. These cookies look absolutely scrumptious! I have the recipe saved and will be making these soon. thank you so much! I love Snickerdoodles and these look yummy! Wow, that looks so yummy and gooey! Would love to try those this year for Christmas! Sounds amazing, looks scrumptious. Thank you for the chance at your giveaway! These look delicious! I can’t wait to try them! I have been looking for new cookie recipes! This looks great! Thank you! Those cookies look amazing. I really want to try the recipe. I love baking and giving as gifts as well as making for son to enjoy with his coworkers.These look delicious.really want to try! Love this! 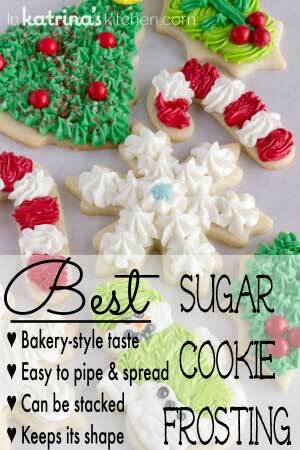 More cookie ideas for my Christmas baking. Biscoff and baking oh yeah!! I would to win this givaway and try some of the baking ideas for Christmas. Those look AMAZING!!! Can’t wait to try! These cookies look delish !! I’ve never heard of these but they look delicious! I’ve been using Biscoff for years, my wife loves my homemade cookies, and loves to brag about my baking to her friends! love the smell of cookies baking in the winter! 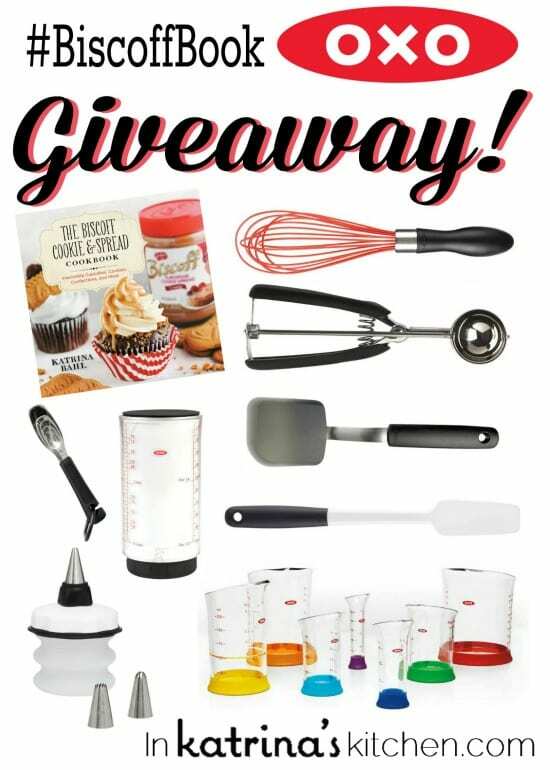 I love OXO and I love making cookies, so what a great giveaway! I have never try Biscoff Stuffed Snickerdoodle Cookies. They sound wonderful. Good Luck on the Today Show. Thanks for te chance to win!! Oh my do those look yummy. I love all your recipes, I am going to have to share this one. The cookbook looks wonderful and the cookies look even better!! This is the first I’ve heard of Biscoff’s, but I know ALL ABOUT Snickerdoodles! YUM!!! I would love to use the cook book! I would love to win the cookies looks so yummy!!! thanks for the chance and congrats on all your hard work! I have to bake these cookies as soon as I buy my next Biscoff spreads. Congrats on your cookbook. Oh my gosh these look good!! I love Biscoff spread! Yummy.. Biscoff is my favorite. OMG, mounds brownies ,I wish I could make them now. I love to bake and I’d love to win even more! Looks like some very tasty recipes…..yum!! Congrats on your new cookbook and being on tv! Your recipes look amazing. You have inspired me! I have never heard of a stuffed snickerdoodle, before tonight! Thank you! I love Biscoff and would love to win the cookbook and all the cooking products! Oh those cookies look delicious!!! Can’t wait to try. Those cookies look and sound awesomely good. I think I might have a surprise dessert for Thanksgiving. Stuffing a snickerdoodle! What a great idea! I wonder what other cookies would be good “stuffed”? These cookies look mouth-watering. Thanks for running the contest. I love anything made by OXO — fantastic kitchen tools! These look so delicious!! I heart Biscoff cookies! Snickerdoodles are my favorite cookies – gonna have to try the stuffed recipe! We have a serious addiction to Biscoff in this house, and I love Oxo!! Great book too – hope I win! Oh these cookies look so yummy. They would be such a wonderful treat for my grandchildren when they come home from school. All I can say is – YUM! i love snicker doodles! These look yummy! I want those cookies so much! I couldnt imaging anyone doing that to me! My brain would shut down LOL! I’m from Southern Alabama. I’m not sure what Biscoff even is. I don’t think we have that around here. Not that I’ve seen anyways. I even asked my wife and she didn’t know either. Its bound to be good though. Well, at least it looks good in the pics, running out of that cookie. Maybe I’ll win and then I get to try it out and see if it’s as good as it looks. Good luck finding it! Our Wal-Mart and Target carries it now as well as our local grocery stores. It is found by the peanut butter. Looks delicious. Would love to get this cookbook and try out these new recipes. These cookies look dangerous. I love biscoff cookies/spread and have to be careful not to go through either too fast when I buy them! The cookies are the best with some nice dark roasted coffee. An to think, I just use cream of tartar for grit when cleaning. I love to make snickerdoodles, but never thought of filling them. I like this idea. Thanks so much for sharing I will be making these over the holidays they sound and look so YUMMY! LOOOOOVE IT! What a great idea. Can’t wait to make thesefor those who haven’t tried Biscoff yet…can you imagine?? Congratulations on your cookbook. It looks awesome! I am a huge Biscoff fan. Gimme a jar and a spoon and I’m a happy girl. Until the bellyache sets in, that is. I love biscoff recipes. I have an oatmeal cookie recipe that I love. Never tried Biscoff before but these look tasty. My favorite spread in my favorite cookie! Yum!! Can’t wait to make these!! Wow, so many Biscoff recipes out there lately! Yummy! I just bought some, but I think I need to stock up on more. Are you kidding? Cinnamon AND Biscoff? Cookie perfection! Wow these look amazing! Can’t wait to try them. Thank you so much for sharing! im obsessed with all things Biscoff!!! Cookies look delicious! Haven’t had biscoff spread before I will definitely look for it at the grocery store, Now! These look amazing! Must try making them! Congratulations on the cookbook! congratulations on the cookbook — such an inspiration! love your website — have made a lot of successful recipes — my fav being the grinch cookies! Congratulations on the cookbook. I would love to win! Would love to win this set!! My son loves to cook, this would be so nice to give him for Christmas!! LOVE this stuff! So glad you were able to put some great recipes together for all of us!